Don't Call It Fanfic: Writers Rework Their Favorite Stories When writers finish a book, they may think they've had the last word — but sometimes another writer will decide there's more to the story, or more to a background character. NPR's Lynn Neary explores the fine old literary tradition of writing new stories based on existing books. 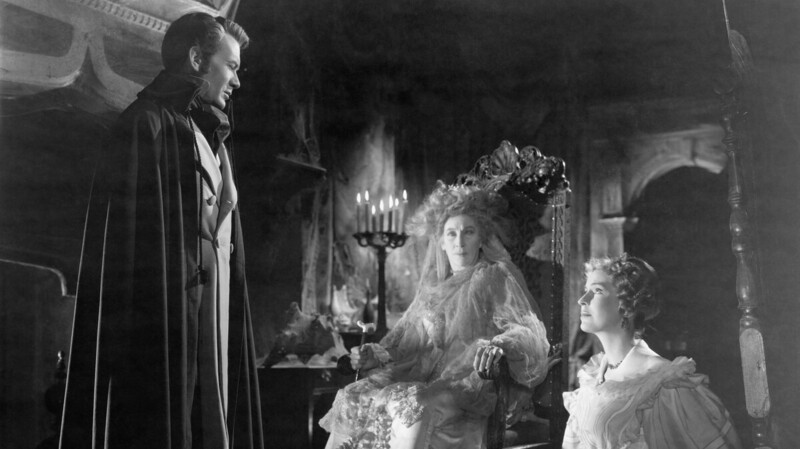 Author Ronald Frame says his reimagining of Miss Havisham was based on David Lean's 1946 adaptation of Great Expectations. When writers finish a book, they may think they've had the last word. But sometimes another writer will decide there's more to the story. The madwoman Bertha from Jane Eyre and the father in Little Women are just two examples of secondary characters who have been given a fuller life in a new work of fiction based on a classic novel. Many writers are attracted to the world of Jane Austen. Jo Baker is a big fan of Pride and Prejudice, but there was something about the book that bothered her: the servants. And if you don't remember any servants in Pride and Prejudice, well, that's what bothered Baker. The servants were so invisible — and she just knew someone was washing all those muddy petticoats. "There was a line in Pride and Prejudice that just stopped me dead, and I couldn't get past it on one of my re-readings," she says. "It's that period leading up to the Netherfield ball when it's just been raining for days and days, and there's no way the Bennet girls are going to venture out into the muddy roads ... but they need these decorations for their dancing shoes. And the line is 'the very shoe roses for Netherfield were got by proxy,' and I just thought, who's proxy?" Baker may have been more sensitive to this than most people — but with good reason. Her relatives, including her grandmother, were in service. So she wanted to know more about the other people in the room who were standing by, waiting to pick up the clothes, do the laundry and cook the meals. Longbourn, the novel that grew out of that curiosity, is not a cute Upstairs, Downstairs kind of thing: Now it is the Bennets who are largely invisible while the servants have complicated, messy, interesting lives that are every bit as compelling as the Bennet girls's quest for husbands. "It was important for me emotionally that they have their own lives and that they have their own stories," Baker says. "For me, the events of Pride and Prejudice have an influence on what's going on, and there are these movements up and downstairs. But it was very important to me that these characters who are silent presences in Austen ... actually got to be active, dynamic and fully realized in their own right." That impulse — to find out more about minor or secondary characters — has inspired many books over the years. Baker took on characters that most readers would barely notice. But some writers decide to fill in the blanks for characters who have become literary icons. Ronald Frame did just that in Havisham, a novel based on the strange and mysterious Miss Havisham of Charles Dickens' Great Expectations. "I didn't want to clutter the book up with references that you needed to understand by going back to Great Expectations, no, not at all," he says. "I just wanted to give Miss Havisham back her youth." Frame says his own image of Miss Havisham has been influenced by the many portrayals of her in movies and on television, especially David Lean's 1946 film adaptation of Great Expectations. When young Pip first meets her, Miss Havisham, left at the altar on her wedding day many years before, is living in a darkened room, dressed in her wedding gown and surrounded by the trappings of that ill-fated day. The Miss Havisham in this film is old, but in fact, Frame says, she was probably only in her 30s — and Dickens provided her with a fairly rich back story. The Catherine Havisham he's created is a combination of the given facts and his own imagination. She is the daughter of a wealthy, widowed brewer, who sends her to live with an upper-class family to be educated and introduced to society. But Catherine falls in love with the wrong man. Heartbroken and bitter, she raises her adopted daughter, Estella, to break men's hearts. Frame says he wrote the book so Catherine Havisham could tell her side of the story. I just wanted to give Miss Havisham back her youth. "What I thought we had in Great Expectations was Pip's version of the story," he says. "I was also of course just fascinated with why a character like Miss Havisham, Catherine Havisham as I called her, who seemed to have everything going for her ... why she turned into this character a mere 10 or 15 years later." Frame's book is set in Dickens' world, but his language is modern and spare, a far cry from the dense descriptive writing of Great Expectations. Daniel Levine took a different tack in the forthcoming novel Hyde, which is based on The Strange Case of Dr. Jekyll and Mr. Hyde by Robert Louis Stevenson. "My interest was actually in keeping to the original as much as possible because what interested me was things that Stevenson left out, because I sensed that Stevenson wanted to say more," he says. In telling Hyde's story, Levine had an added challenge since Jekyll and Hyde are two sides of the same person who have come to embody the very idea of good and evil. But Levine says it's not that simple. "The story is not really about Jekyll who is pure good and Hyde who is pure evil. Jekyll does many things in the Stevenson version that when you look at them are very suspect and very self-destructive ... and so we know that Jekyll is not pure good. And so by default we know that Hyde is not pure evil — and in my version I was really trying to make him a real person." All three authors say their books can stand on their own. But, Jo Baker adds, as much as she loves the characters and story she has created, they wouldn't exist without the original. "It just emerged so organically ... out of the world of Pride and Prejudice that I don't think I could have written it in any other way. ... There was this itch I needed to scratch. ... That's what this book came from, so it wouldn't have got written." There is one thing no one will ever know about these books: Whether the original authors approve of what has happened to their creations — or not.